From Butler go south on U.S. 71 Highway to Missouri Highway 52, turn east (left) and go 4 ¼ miles to County Highway N. Go south (right) on N for 4 1/8 miles to County Road 3506. turn east (left) and go 1/8 mile. The cemetery is on the south side of the road across from Double Branch Church. Co C 33 Regt Mo Inf. wife of William Pearson, Sen. The Double Branch Christian Church was organized in 1856 in Pleasant Gap Township. Church leaders John Wilson, Joseph Beaver and John Henry met in a log cabin on the west part of what is now the cemetery to form the church. In the fall of 1876, the church burned and a new church was raised in 1878. Brother R.A. Blalock, Nevada, Missouri was the minister of the new church. In 1925, the church was torn down and rebuilt with funds raised from church picnics, farm sale lunches, food sales, suppers and quiltings. The Double Branch Christian Church was organized in 1856 in a log cabin on the west part of what is now the cemetery. Church leaders were John Wilson, Joseph Beaver, and John Henry. In the fall of 1876 the church burned, and a new church was built in 1878. Brother R. A. Blalock of Nevada, Missouri, was the minister. 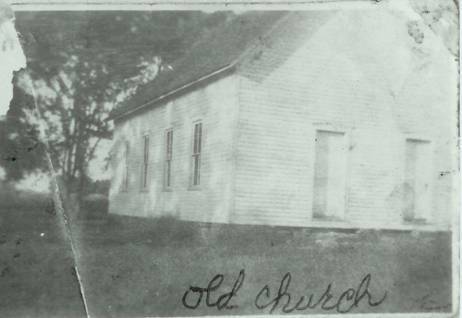 The original Double Branch Church, in Pleasant Gap Township, was torn down in 1925 and rebuilt, from funds raised by church picnics, farm sale lunches, food sales, suppers and quiltings. The second church is still standing. Recently, a new church was added to provide additional space.